Do you like Diet Coke? Do you like brain freeze? Congrats! Today is your lucky day. Meet Diet Coke Frost Cherry. This new product from the Coca-Cola company is basically just a cherry Coke-flavored Slurpee, but diet. It's the diet part that counts. 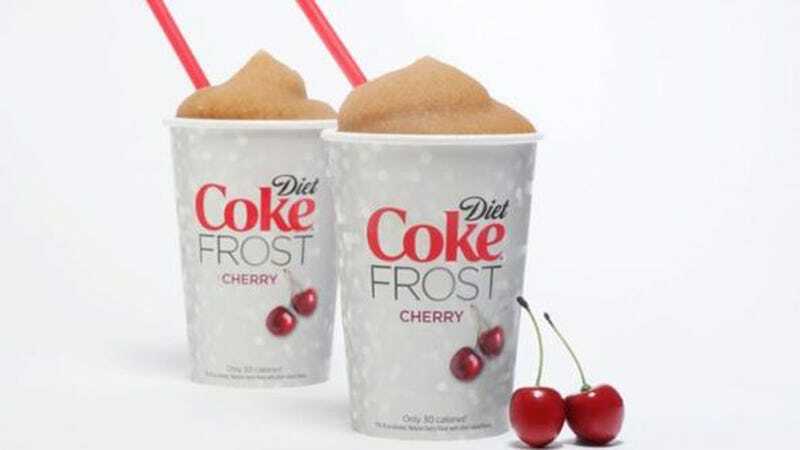 As the company puts it, Diet Coke Frost Cherry is "the first frozen offering in Diet Coke's 31-year history." While there's obviously no way this thing can capture the sharp chemically sweet bubbly effervescent metallic tang of regular old canned Diet Coke, come summer when we deal with the Death Valley Apex (or whatever the opposite of a polar vortex is), it might end up having a certain allure.